Once you understand the basics of screenwriting, ideas for your next screenplay are everywhere. Whether it comes from a favorite children’s book, a summer novel you discover accidentally, a news story that catches your imagination, or a chapter from your own life — advanced screenwriting strategies should now guide you through your first adaptation. In Screen Adaptation: Beyond the Basics, award-winning screenwriter Eric Williams uses examples from award-winning screenplays to explain new storytelling techniques. His real-world examples illustrate a range of advanced approaches — including new ways to identify and craft tension, how to reimagine structure and character, and how to strengthen emotional depth in your characters and in the audience. 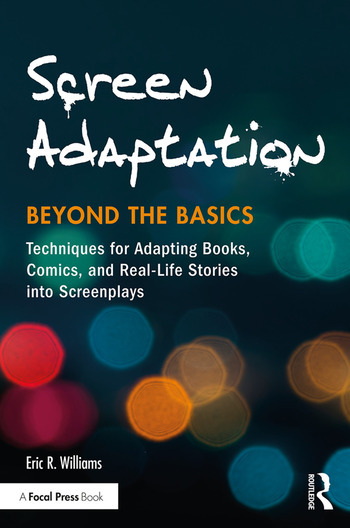 Screen Adaptation: Beyond the Basics teaches readers new ways to engage with source material in order to make successful adaptation decisions, regardless of the source material. New screenwriting techniques developed by the author, including the Triangle of Knowledge, the Storyteller’s Parallax, and the idea of Super Genres as part of a Screenwriters Taxonomy. Adapting Jo Weiss’ "The Pool"
Adapting Damion Armentrout’s "So the Young Enter the World"
Eric Williams’ screenplays have received the Best New Work award from the Writers Guild of America, an Emmy Award from the National Academy of Television Arts and Sciences, and the Award for Individual Excellence in Screenwriting from the Ohio Arts Council. He has adapted novels by Luis Urrea (Across the Wire), Bill Littlefield (The Prospect) and Guillermo Fadanelli (The Other Face of Rock Hudson). His latest projects include an adaptation of the anthology Voices From the Heartland into a thirteen-part television series. Eric received his MFA from Columbia University’s School of Film. He currently teaches at Ohio University, where he has received the University Professor Award for Excellence in Teaching.